It is now Dorset’s most famous and romantic ruin, but at the beginning of the Civil War Corfe Castle was of course still perfectly intact, and not only a formidable stronghold but also a luxurious home. In 1635, the castle and its estate had been bought by Sir John Bankes, Attorney General to King Charles I and a rising man at court. In 1640, Charles appointed him Chief Justice of the Common Pleas. Sir John and his wife, Lady Mary Bankes set about refurbishing the castle at great expense to the height of fashion and comfort. According to later accounts, the castle was full of fine tapestries and hangings of plush, silk or leather, Persian and Turkish carpets, curtains and cushions of velvet and damask, inlaid and upholstered furniture some imported from abroad, a library of books and papers worth £1,300 and paintings by Vandyke, Lely and other leading artists of the day. On the outbreak of the Civil War in 1642, Sir John joined the king while Lady Mary and their younger daughters stayed at Corfe. Their sons were sent for safety to the household of their brother in law Sir John Borlase in Oxford. 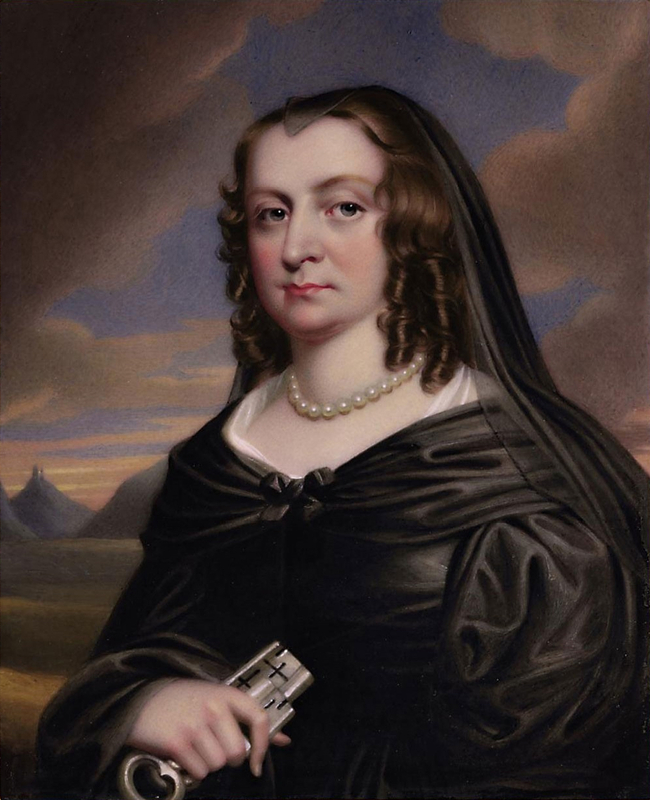 In 1643, with a Royalist garrison of about 80 men, Lady Mary endured a siege of the castle by Parliamentary forces from Poole under the command of Sir Walter Erle. The former royal castle was very well defended. Its position on top on a steep hill commanded the approach roads into the town and the keep was protected by three lines of defences. Curtain walls, punctuated by towers and a massive gatehouse surrounded the outer bailey. Then the attackers had to cross a great ditch and force another gatehouse with double portcullis to enter the second ward or west bailey before attacking the inner ward itself, the whole approach being within firing range of the keep. 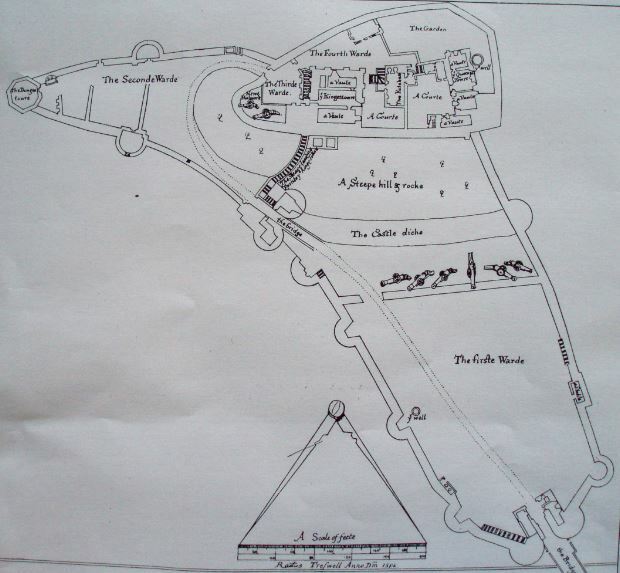 The attack with cannon, siege engines and scaling ladders was met with a spirited defence and the building was so strong that the Parliamentary forces could make no impression upon it. In August, the siege was broken off abruptly with the approach of Royalist forces and the fall of Weymouth, Portland and Dorchester. It was a high point for the king’s cause in Dorset with Lyme and Poole being the only remaining Parliamentary strongholds in the county. Sir John Bankes was able to visit Corfe briefly but in December 1644 came the news of his death at Oxford. 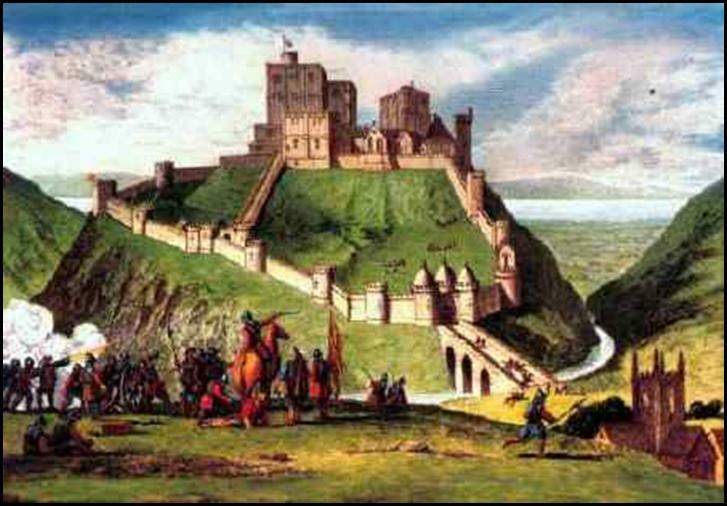 The second siege of the Corfe Castle in 1645-1646 took place in very different circumstances from the first. In Dorset, most of the main towns were back in the hands of Parliament. After three years, the country was weary of conflict and the destruction of the king’s main army at the battle of Naseby in June 1645 was a decisive stage in his ultimate defeat. Locally, however, the Royalists were far from defeated. In May, Sir Anthony Ashley-Cooper had been instructed ‘to repair to the Isle of Purbeck and to draw together as speedily as may be, out of the garrisons of Poole, Wareham, Lulworth and Weymouth, such numbers of Foot and Horse as are sufficient to block up Corfe Castle.’ He was also given the discretion to treat with the defenders and accept their surrender on any reasonable terms. It took some time to obtain the necessary forces but in June, the Parliamentarians carried off a small coup. The garrison of the castle were in the habit of grazing their cows and horses outside the castle walls by day and bringing them in at night. Colonel Robert Butler led a party of horse and foot from Wareham by night and hid within reach of the castle. While Captain Jordan and Captain Lawrence and the foot soldiers attacked the garrison and pushed them back towards the castle, Butler with his troop of horse rounded up 140 head of cattle and 20 horses and drove them away to Wareham. It must have been quite a blow to the beleaguered garrison. By December, Colonel Bingham, the military Governor of Poole was besieging Corfe with troops from Colonel Pickering’s regiment and hoping for reinforcements from Sir Thomas Fairfax. However the army was busy trying to eliminate opposition in other parts of the West Country. In February, a force of 120 Royalists under a Colonel Cromwell, wearing scarves identifying them as Fairfax’s horse troops, managed to enter Wareham where the Parliamentary troops were based under Colonel Cooke. The only one to suspect them was Colonel Robert Butler who shut himself in his house and defended it against them until it was set on fire. As it was close to the powder magazine, Butler and his son surrendered and were taken as prisoners into the castle. When the triumphant Royalists returned to Wareham, however, Cooke drove them off and took several prisoners. Colonel Butler later escaped from Corfe together with Robert Lawrence, who had been head of the castle garrison during the first siege. The fact that he was now prepared to change sides suggests that he felt the king’s cause was lost. The fall of the castle came later that month. Lieutenant-Colonel Thomas Pittman, a member of the garrison, secretly agreed to deliver the stronghold to Parliament in return for future protection. 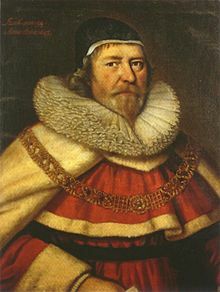 He then arranged with the castle’s governor, Colonel Henry Anketell, to go to Somerset for reinforcements for garrison. In fact the men that he brought back were specially selected Parliamentary troops. Anketell met the party at the eastern sally port of the castle but when half of them had entered he refused to let any more come in. Pittman argued with him, saying that he was risking the men’s lives by leaving them outside. Meanwhile, those who were already inside seized the keep, the Queen’s tower and two platforms and held them against the garrison until daybreak when the besiegers attacked. The following day, the 27th February 1646, the castle was taken with 140 prisoners, 17 barrels of powder and various stores and provisions. Around 30 Parliamentary prisoners were freed. Colonel Bingham wrote to William Lenthall, the Speaker of the House of Commons: ’After extraordinary dutie some slayne and many wownded, God hath strangely delivered the Castle of Corfe into our hands.’ In Poole, still in the grip of a plague outbreak and suffering from severe food shortages, the accounts record 4 shillings paid ‘to him tht brought newes of taking Corfe Castle’ and 4 pounds of prunes to the guards, probably the only sort of treat to be found in the stores. The siege had lasted 48 days, but the castle had been holding out for the king for nearly 4 years. According to many accounts, Lady Mary Bankes and her daughters were among the prisoners. The story is that Colonel Cromwell’s daring attack on Wareham was partly to allow her to escape from the castle but that she refused to go. As she left castle, Colonel Bingham is supposed to have presented her with the keys as a tribute to her gallantry and there is even a romantic suggestion that she threw the family’s silver plate down a well so that it would not fall into the hands of Parliament. The fact is that she may well not have been there. 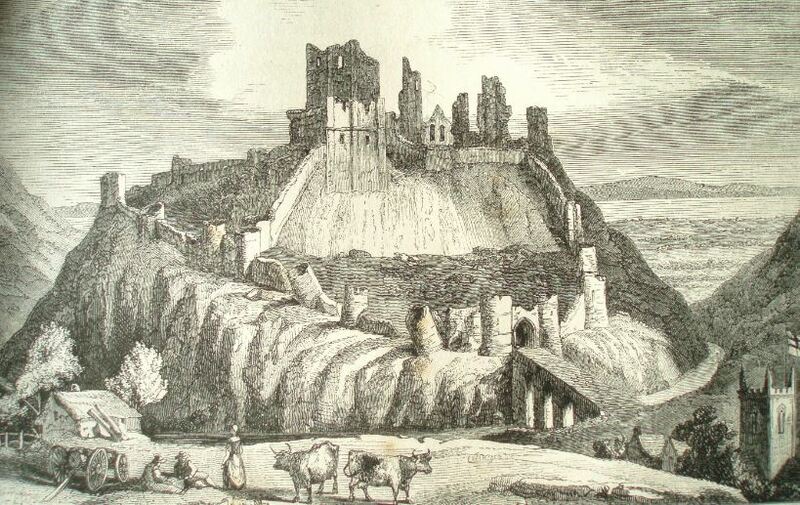 In Thomas Bond‘s History and Description of Corfe Castle, he states that from Sir John’s death ‘until June 1646, and perhaps longer, Lady Bankes, his widow, resided in London.’ Certainly government records show that on 16th July 1645, a pass was issued by William. Lenthall, ‘for her, with 2 daughters and 4 servants, to come to London to compound, within 10 days, provided she be taken and brought to Haberdashers’ Hall.’ Her petition to ‘compound’, in other words to make her peace with Parliament on the payment of a large fine, was deferred in September, again in October and continued into March. So it seems probable that she was out of Dorset during the whole period of the second siege and the fall of the castle. There was no brave refusal to escape, no acceptance of the keys as a gallant loser, at least not then, and no silverware down the well. However this does not detract from her resolute conduct during the first siege. Following the fall of the castle, it seems to have been thoroughly plundered. The rich furnishings of the Bankes’ apartments were too tempting to resist for men who had suffered losses of their own through the wars. Sir Walter Erle and Colonel Bingham were among those who helped themselves to some of the plunder. On 5th March, Parliament ordered the demolition of the castle so that it could no longer be used as a stronghold against them. Captain Thomas Hughes of Lulworth was given the task of reducing it, a work which was to last for months. During the next few months the peace of the small village of Corfe was shattered by a series of huge explosions as the demolishers undermined and then blew up the castle structures. Sections of curtain wall were toppled down the hillside and the towers left ruined and tilting. The 13th century gateway leading to the west bailey was split into two, with the south tower slipping several feet to the south. In the west bailey, the Butavent Tower dating from about 1202, was undermined and badly damaged. Hardest of all to destroy was probably the early 12th century keep itself with its walls 12 to 15 feet thick. After the structure had been weakened by undermining, it was torn apart by massive explosions, the whole of the north side falling across the inner ward in a jumble of masonry and fractured timbers. It must have felt like an earthquake as thousands of tons of stone hit the ground. The demolishers had made sure that the castle could never again be used as a stronghold or a home. It was left to the mercy of the weather and the stone robbers. After the Restoration, Sir Ralph Bankes tried to track down some of the property that had been plundered from Corfe which had ended up in the homes of Dorset gentry or been sold to dealers. Among others he wrote to Sir Walter Erle and John Bingham but got very little satisfaction from either of them. This entry was posted in People, Places by poolemuseumsociety. Bookmark the permalink.